St Giles’ 110ft high tower is built of red sandstone and dates to the 13th or 14th century although it was entirely refaced in 1894. The tower rises in four stages and has double buttresses for its full height at the two western angles. The tall second stage contains the ringing chamber and has windows of 14th century style. The third stage, or clock chamber, has two-light windows with tracery of the later 14th century. The highest stage, or belfry, is strengthened at the angles by internal piers of masonry, possibly to give support to a projected spire. The windows, of two and three lights, are of 15th-century character, as also is the embattled parapet with crocketted pinnacles at the angles. In 1553 there were four bells. There seem to have bee n five in 1628 and they certainly numbered five in 1665. In 1732 they were recast by Abraham Rudhall, the Gloucester bell-founder, as eight and they were rehung in 1894. Two further bells, paid for by churchfolk and townspeople and cast by Gillett & Johnston of Croydon, were added in December 1928 and they also installed the current steel bell-frame. 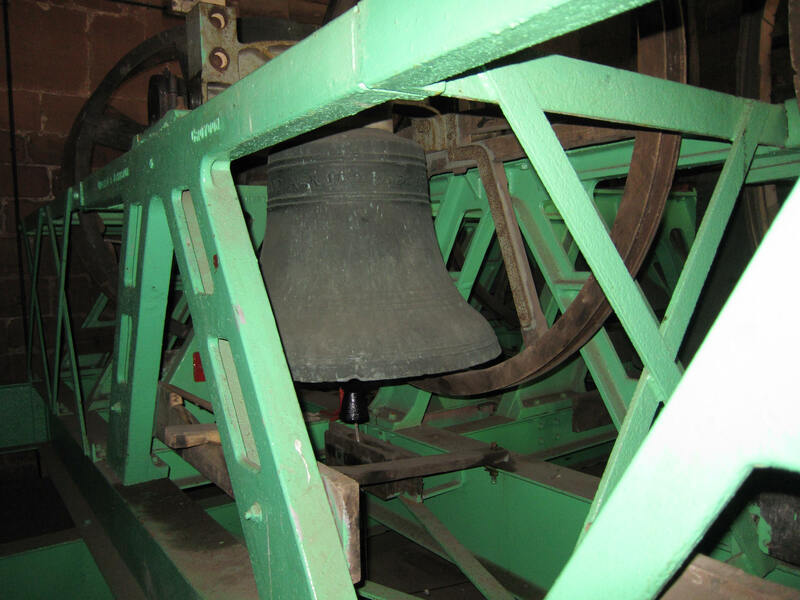 In 1980 the two smallest bells given by the Wain family and hung by public donation were cast by the Whitechapel Bell Foundry and brought the complement up to 12. St Giles is the only 12-bell tower in North Staffordshire and is used by teams practising for national competitions. 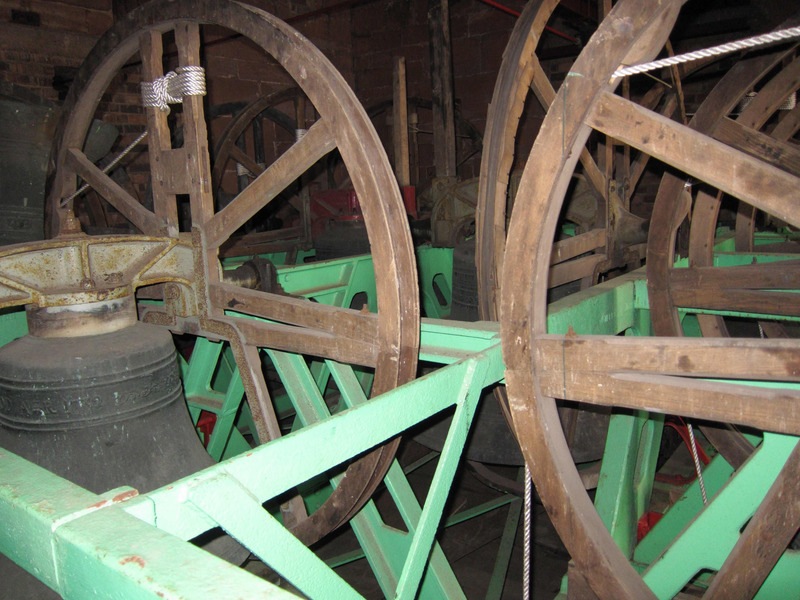 The bells weigh from 193 kg to 813 kg and total 4604 kg. Their diameters are from 59 cm to 120 cm. We practice on the 1st and 3rd Fridays in the month at 7.45pm and on the 2nd and 4th Fridays we practice at our partner tower of Wolstanton Saint Margaret’s at 7.30pm. On 5th Fridays we usually visit a local tower and we also arrange regular meals out to develop fellowship amongst our ringers. We also support the ringing centre at Keele and encourage new recruits to practice there on their simulator on Tuesday evenings. Although we currently don’t ring regularly for church services we do ring for special occasions (such as Christmas, Easter and Remembrance) and for weddings. Bells are the perfect way to get gentle physical exercise and increase active living for people who are looking for alternatives to conventional sport. What’s even better is that bell ringing is open to everyone – young and old – and with any level of existing fitness. Whilst bells can weigh up to 4,500kg, most are much lighter and are rung using mainly technique rather than strength. The movement of bell ringing often helps many people to stay active longer and increase agility. Indeed, recent research commissioned by The Churches Conservation Trust asked experts from fitness and training provider YMCAfit to observe the process of bell ringing. They found that bell ringers could look forward to improved agility, co-ordination, reaction time and balance, plus improved muscle endurance and cardiovascular fitness. The study also identified that as a gentle and inherently sociable pastime, bell-ringing was an ideal ‘gateway’ to improved fitness and healthy living. Bell ringing requires you to think and use your memory, which is great for keeping the mind as well as the body active. And the fact it’s a social activity means it’s an ideal way for everyone to feel part of a group and embedded in their own communities.